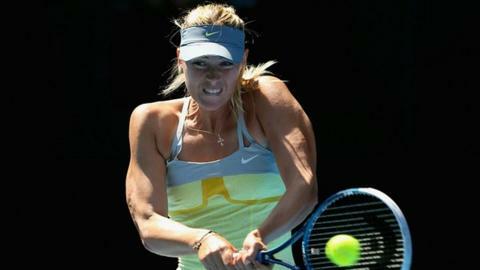 Maria Sharapova and David Ferrer made easy progress into the quarter-finals with convincing wins on day seven at the Australian Open. Second seed Sharapova wasted little time beating Kirsten Flipkens 6-1 6-0, while fourth seed Ferrer strolled past Japan's Kei Nishikori 6-2 6-1 6-4. Women's fourth seed Agnieszka Radwanska easily beat Ana Ivanovic, but fifth seed Angelique Kerber crashed out to 19th seeded Ekaterina Makarova of Russia. Moscow's Makarova added the scalp of Kerber to her collection after knocking out Serena Williams at the same stage last year. Germany's Kerber was hampered by a back injury as Makarova won in an hour and 32 minutes. Kerber said: "I could move; that was fine. But just my serve, when I go back, there is a lot of pain there. "I actually feel it like two, three days. So I was thinking it will be maybe not too bad, but in the first set I was feeling that and it was actually worse and worse." Makarova will next face compatriot Maria Sharapova and said: "I think it will be really interesting and I really want to play against her [Sharapova]. "Last year I was so surprised [to reach the quarter-finals] a little bit and had so may thoughts on my mind. This year, I'm a little bit used to it. I think I'll be ready to play a good game." Fourth-seed David Ferrer eased into his third straight Australian Open quarter-final in two hours 10 minutes against the 16th seed. Japanese number one Nishikori had won two of their previous three matches and was a quarter-finalist in Melbourne last year, but struggled with 65 unforced errors to the clinical Ferrer's 24. "I started very well and when I won the first games he got down a little bit and I took my chance," Ferrer said. "I didn't make any mistakes for the first two sets and to reach the quarter-final here again I am very satisfied." The Spaniard, who is playing in his 41st consecutive Grand Slam tournament since his debut in Melbourne in 2003, will meet countryman Nicolas Almagro. Ferrer will also move into the top four in the world rankings given Rafael Nadal's injury absence. The second seed, who began with two 6-0 6-0 wins and then trounced Venus Williams, began slowly and took 43 minutes to win the first set. But she won the second in 25 minutes against the 27-year-old Belgian to set-up an all-Russian clash with Ekaterina Makarova. "I'm certainly happy that I'm playing this well but it's now the quarter-finals and it only gets tougher," said Sharapova, the champion in 2008. Ivanovic had not beaten her Polish opponent since 2008, and never looked in serious contention against Radwanska, who broke her in the first game and took the first set in 27 minutes. The second set also started badly as Ivanovic double-faulted to hand Radwanska a break point in the first game and held serve to round off the victory in 43 minutes. Radwanska will now face China's Li Na in the quarter-finals. The world number one lost the first set and trailed 5-2 in the second before eventually triumphing 12-10 in an epic fifth set to set up a quarter-final against Tomas Berdych. Almagro was leading 6-2 5-1 when Tipsarevic retired with a jarred heel. "That's not the way you want to win," said Almagro. "But that's sport. "Sometimes you can't do your best and you need to stop. I think he made the best decision." Almagro, seeded number 10, has lost all 12 of his previous matches with Ferrer but he said: "It is a big opportunity for me to be in a semi-final. "I'm ready to fight. I'm healthy and happy with my tennis." Out on court 10, 17-year-old Katy Dunne of Hemel Hempstead won her opening match in style in front of Judy Murray and Jeremy Bates.